We offer a spectacular collection of Horn Beaded Necklaces. Available in various styles, designs and colours these necklaces are designed to perfection and as per the latest fashion trends. 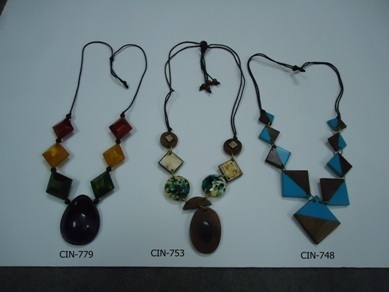 These necklaces can compliment one's outfit, be it traditional or modern. Prepared from finest quality beads, these necklaces are known for their fine finish and shine. Since our inception, we are engaged in offering an exclusive range of Metal Beads, Fashion Jewellery and Beaded Belts. Further, we also offer an elegant collection of Handicraft Items and Jute Products. All these items are widely appreciated in the international market for their unique designs and vivacious colour combination. With the assistance of our creative professionals, we are able to offer the best quality and designs of jewellery items and accessories to our worldwide customers. We had also set up an export unit in the year 2004 that has been a great help to us in ensuring the quality of our products while offering them to our international customers. Due to the help of our creative and experienced professionals, who are well acquainted with the latest fashion trends, we have been able to provide our customers with the latest designs and patterns that are in line with the international standards. Apart from the manpower, we are also backed by a magnificent infrastructure, which is provided with an in-house designing and crafting unit. Further, our well equipped and capacious production unit has helped us in meeting the bulk requirements of our customers within a defined time frame. All these efforts have collectively helped us in garnering a spread out clientele all over the world.